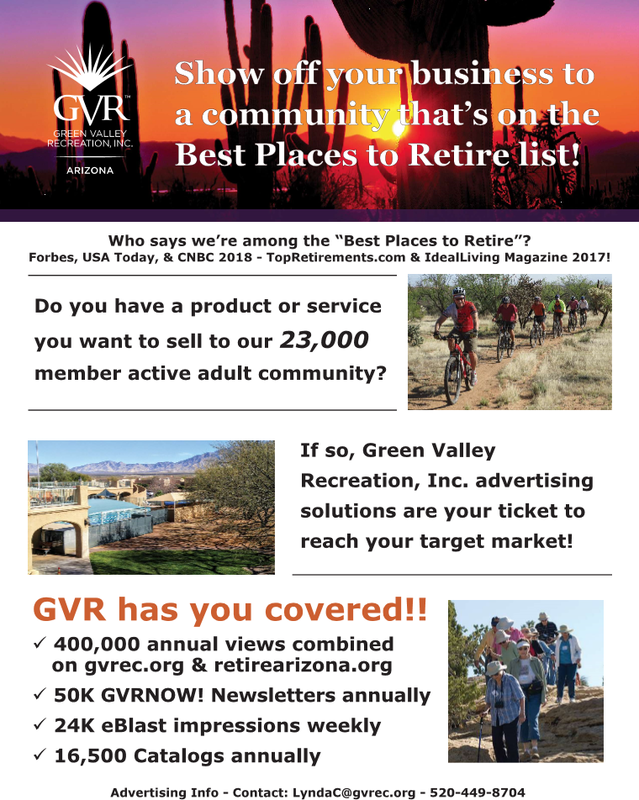 Get your product or service in front of Green Valley Recreation’s 23,000 members in our 55+ active adult/retirement community of Green Valley, Ariz., by advertising with GVR! Whether you are a local business or a national brand, you can reach this attractive market niche with GVR! We are now accepting reservations for print advertising in GVR’s popular Class Catalog and Arts & Entertainment program guide. Plus, you’ll receive double the exposure from advertising in these publications with our online versions! GVR also offers sports court banners as well as digital ads in our weekly eblast, which has more than 12,000 subscribers. GVR also offers several sponsorship opportunities for various programs and events, including the annual Southern Arizona Senior Games, GVR’s Free Lecture Series, and GVR’s Arts & Entertainment Performing Arts Season. Call for more details.